If you have an olive tree, try curing your own ripe olives at home. Plan ahead to allow at least 3 weeks brining time for the olives, plus 3 days marination time. Gather the ingredients. For this recipe, choose olives that are red to dark red. Slash each olive deeply on one side using a very sharp knife to reduce bruising. 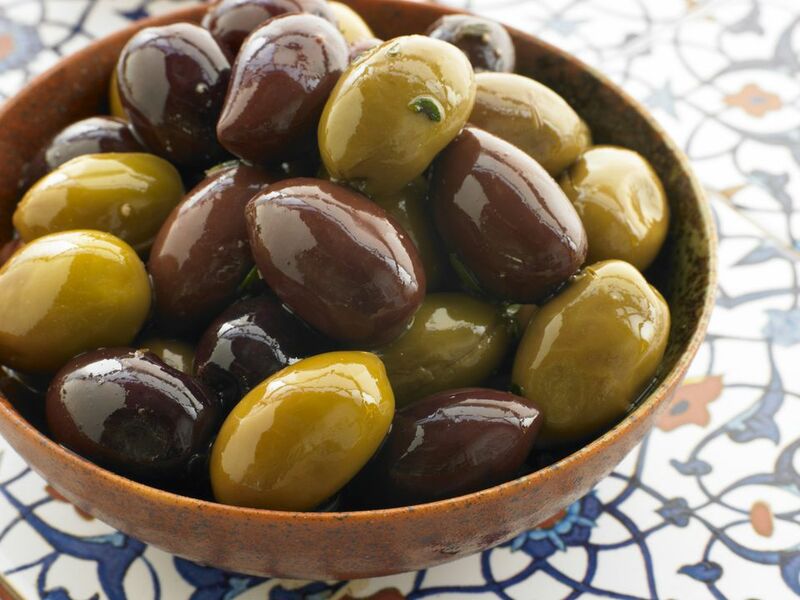 Place olives in a large stoneware, earthenware, glass, or porcelain container. Make a solution of 4 tablespoons salt dissolved in 1-quart water, and pour enough over the olives to cover; then weight the olives with a piece of wood or a plastic bag filled with water so that all of them are completely submerged. Store in a cool place, changing the solution once a week for three weeks. If a scum forms on the surface during that time, disregard it until it is time to change the brine; then rinse the olives with fresh water before covering with brine again. The scum is harmless. At the end of three weeks, taste one of the largest olives. If it is only slightly bitter (these olives should be left with a bit of a tang), pour off the brine and rinse the olives. If the olives are too bitter to be put in the marinade, rebrine and soak for another week; then rinse and marinate. Then marinate them with the proper amount of liquid to cover in a marinade. Combine white wine vinegar, salted water, oregano, lemon, and garlic. Add cured olives and stir to coat. Float enough​ olive oil to form a 1/4-inch layer on top of the marinating olives. The olives will be ready to eat after sitting in the marinade for just a few days. Store, still in the marinade, in a cool pantry, or in the refrigerator. If kept too long, the lemon and vinegar flavors will predominate so eat these within a month after they are ready.